A couple of weeks ago, we went to the nearby city for the weekend with our school for a Model UN conference (kind of nerdy, we know, but it was fun. Well, at least it was fun walking around the city to shop and eating basically all meals at restaurants!). Out of all the great restaurants the city has to offer, we ended up going to Chili’s for dinner the first night because it was close, and it was also really cold and late. Celine got a similar version of these Southwestern egg rolls and they had a filling with questionable components, even though they tasted pretty good. She thought that they could be way better homemade, as most things are, and these were happily no exception. 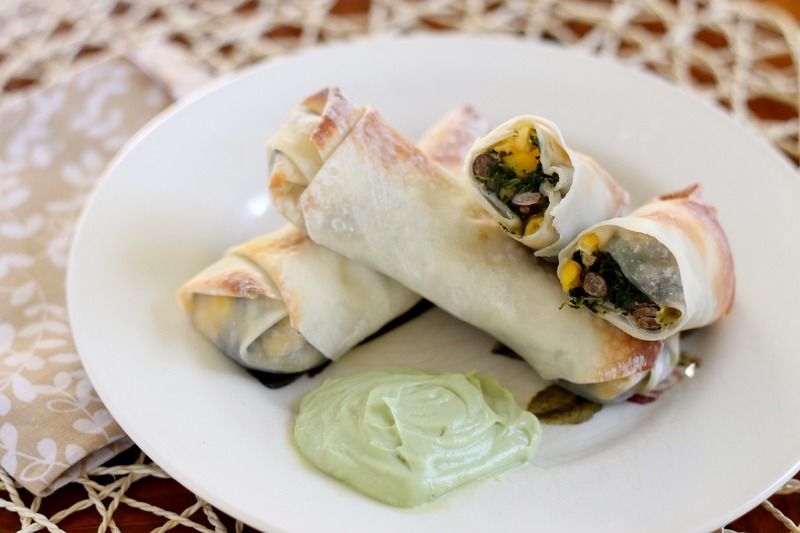 Southwestern egg rolls? We know, we were suspicious of these before we tasted them too. Let’s face it, they aren’t the prettiest things ever and the combination of an Asian egg roll with a Mexican filling just seems wrong. But trust us, it isn’t. Besides the best guacamole ever and Grandma Pizza, these are one of our favorite savory things to make (shockingly!). The filling is made up of corn, green onion, black beans, spinach, plenty of cheese, and spices. Dipped in an avocado lime cream sauce, they are out-of-this-world good. We can’t wait to make them again! Combine all the filling ingredients large bowl. Mix well to blend. Place about ¼ cup of filling in the bottom center of an egg roll wrapper (have the wrapper in a diamond shape with a point facing you). Fold the tip pointing to you to you over the filling, then roll once. Fold the sides over the filling and roll until a small point is left. Dip your finger in water and use it to moisten the remaining point. Push it firmly against the roll to seal. Repeat with the remaining filling and wrappers. Preheat your oven to 425º. Lightly coat a baking sheet with cooking spray. Place the egg rolls, seam side down, onto the baking sheet. Lightly coat the tops of the egg rolls with cooking spray. Bake for about 15 minutes, turning halfway through baking to brown both sides. Serve warm with salsa, avocado cream sauce, etc. Enjoy!